A diverse range of agricultural practices and social relations proliferated between the Neolithic origins of farming and the early modern period which began some 500 years ago. But in order to explore the future of food production under climate change, it is this transition to modern agriculture which is of most interest. This question is intimately bound up with the origins of capitalism. Here, climate change and class relations combined, and through a series of food crises led to the transformation of world agriculture through enclosures and colonialism. The Little Ice Age of 1550-1850, while not a true ice age, was a period of global climatic cooling which was most pronounced in the northern hemisphere. Cold summers and freezing winters caused crop failures, chronic food crises, and famines across the world. In the Ottoman empire (centred in modern-day Turkey), this exacerbated conflicts over land, peasant rights, and agrarian taxation, and provoked flight to the towns and food riots. In the Mughal empire (a Persian empire extending into most of modern-day India), the Little Ice Age saw a series of famines and food crises, the worst of which occurred in 1630-1632. The Shah (in)famously began building the Taj Mahal in 1631 to commemorate his dead wife, diverting huge resources which could have been used for famine relief. Mounting rebellions and rural conflicts weakened the Mughal hold on India, and contributed to the relative ease with which the British took control of the region from the mid 18th century. In the Americas, both the Aztec and Inca empires had developed sustainable agricultural systems, but imperial expansion overstretched their food production capacities. This provoked agrarian rebellions and internal political conflicts. When the Spanish arrived from the early 16th century, they encountered empires in crisis, wracked by civil wars. This greatly aided the conquistadors, who were able to ally with rebel factions before taking control. In Europe, reactions to the Little Ice Age were polarised on an east-west axis. In the east, the balance of class forces favoured the landed aristocracy, who were able to reimpose a 'second serfdom' on the peasantry. Servile practices were reimposed, and "Russian nobles sold serfs just as American planters sold slaves. "3 But in the west, the balance of class forces was more favourable to the peasantry, who won emancipation in numerous kingdoms and republics. 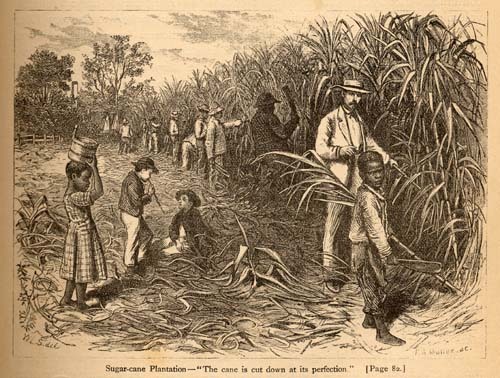 While Spain was busy constructing the largest slave-based agricultural system in history in its American colonies, its domestic peasantry and Moorish slaves won emancipation. The Western European maritime powers, principally the Spanish, Portuguese, and Dutch, followed by the British, French, and others, were busy constructing colonial empires across the globe from the late 15th/early 16th century. This involved the construction of plantation complexes oriented to cash crops for export. The interest-bearing and merchant's capital which funded these conquests belonged to what Marx called "the antediluvian forms of capital, which long precede the capitalist mode of production. "4 That is to say that in themselves, the circuits of colonial capital served to reproduce the feudal social relations of their home countries. The emergence of a distinctly capitalist mode of production would coalesce only later. The Dutch were most active in colonising the Western Pacific. Where the colonialists encountered hierarchical social systems, they were often able to co-opt local elites and thus formally incorporate local labour into their trading empires. However, when they encountered more egalitarian societies, this option was not available. One such society was the Banda Islands in modern day Indonesia. Here, village life was governed via assemblies, which limited the power of would-be elites, the orang kaya ('moneymen'). When the orang kaya made contracts with the Dutch, the village assemblies promptly ignored them. The civilised Dutch set out to teach these savages a lesson in the rule of law, and proceeded to slaughter them. The net effect of the plantation complexes in the Atlantic, Americas, and Western Pacific, was dramatic depopulation and the replacement of subsistence modes of agriculture with cash crop production for the world market. Thus accumulated capital met landless workers, kick-starting a cycle or rural accumulation and dispossession which would provide both the labour force and some of the capital which fuelled the industrial revolution a century or so later. In effect, this transformation meant a shift from politically appropriated surpluses in kind or in taxes and tithes which sustained the feudal ruling class, to economically appropriated surpluses accruing to the owners of agricultural capital as surplus value - a shift synonymous with the emergence of the capitalist mode of production. But this development was not simply an English peculiarity, or rather, this peculiarity was not a wholly English development. That is to say, the balance of class forces that favoured the emergence of free wage labour in England had an irreducibly geopolitical dimension. European geopolitics in the early modern period were significantly structured around the power of the Ottoman Empire. Europe's military powers were thus oriented to the east, with little heed paid to the English backwater. As other European powers emulated the English example, capital flows from the colonial plantation complexes found productive investment opportunities, given the newly emerging European proletariat. Cleared from the land, Europe's proletarians had little choice but to accept whatever wages they could find, on farms or in the fledgling manufactures. Even then, they resisted. Vagabonds were criminalised and soldiers deployed to clear the land and put down rural revolts. While political economists made arguments for the superior economics of free wage labour - after all, a capitalist is no longer responsible for the reproduction of his 'hands'13 - it was revolt which proved a major driving force in the transition to free labour outside Europe. Slave revolts put abolition and emancipation on the agenda, most notably the Haitian revolution of 1791. Here, insurgent slaves scandalously took the universalist proclamations of the liberty emanating from the French Revolution two years prior to apply to all, including themselves. From the point of view of agricultural transformation, the European enclosures and the plantation complexes in the Atlantic, Americas, and Western Pacific formed two sides of the same historical process. This was a widespread shift from subsistence to commodity production, entailing the bloody separation of the rural population from the soil. Climate change, in the form of the Little Ice Age, had caused crop failures, chronic food crises, and famines around the world. The societal responses to these crises were mediated by the extant social relations, institutions, and the balance of class forces. As the circuits of European merchant and banking capital sought new profits in the colonies, enclosures and clearances created a landless proletariat in Europe. As the European empires expanded, they encountered empires facing crises of their own. This facilitated the conquests, which were invariably followed by massive depopulation through disease and intentional mass slaughter. Colonial genocide provided returns on capital which flowed back to Europe, finding profitable investment in the employment of the new proletariat. Thus the colonialism of the late feudal period and the transformations of early modern agriculture formed a feedback loop which gave rise to a new capitalist mode of production. Henceforth agricultural production became increasingly commodity production, as subsistence producers were expropriated, exterminated, or pushed to the margins. While the story of capitalist agriculture certainly does not end here, the basic contours of the contemporary world agricultural system were all in place by the end of the Little Ice Age. 1. Neil Roberts (1997), The Holocene: an environmental history, Blackwell, p.155. 2. Mark Tauger (2011), Agriculture in world history, Routledge, p.60. 3. Tauger, op cit, p.68. 4. Karl Marx, Capital volume 3. 5. J L van Zanden (1993), The rise and decline of Holland's economy, University of Manchester Press, pp.76-77. 6. Karl Marx, Capital volume 1. 7. Tauger, op cit, p.76. 8. For the classic account, see: Robert Brenner. Marx recounts this process here. 9. Kerem Nisancioglu (2012), Before the deluge, the Ottoman origins of capitalism. 11. Karl Marx, Capital volume 1. 12. Silvia Federici, Caliban and the witch, p.104. 13. For example see Adam Smith in The Wealth of Nations: "From the experience of all ages and nations, I believe, that the work done by free men comes cheaper in the end than the work performed by slaves. Whatever work he does, beyond what is sufficient to purchase his own maintenance, can be squeezed out of him by violence only, and not by any interest of his own." 14. Tauger, op cit, p.89. From the point of view of agricultural transformation, the European enclosures and the plantation complexes in the Atlantic, Americas, and Western Pacific formed two sides of the same historical process. - not forgetting Perelman's detailed examination the real intentions and goals of the classical political economists in obscuring the state's coercive role in primitive accumulation, available here and of course James' fantastic account of the 'Haitian' (San Domingan) revolution in the library.